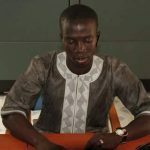 A young and hard working Gambian who dedicate his life to journalism. The love for my country inspired me to stand up and fight to end dictatorship in The Gambia. I love my job and am thankful to the almighty that am growing everyday.